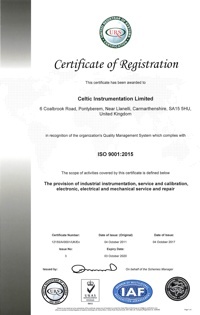 For almost 30 years Celtic Instrumentation Ltd has specialised in on-site service and calibration throughout the UK. As an ISO 9001:2015 quality registered company, we help industries with their specific instrument & equipment calibration needs. Celtic Instrumentation Ltd can provide an UKAS or equivalent internationally recognised traceability document on all of the test and measurement equipment we use. We endeavour to offer our customers the most effective and cost efficient way of satisfying quality audit trails and site system calibration requirements.